Just in time for the 2016 Summer Games, TPG Contributor Nicholas du Pont (who studied, lived, and loved in Rio), tells us what to see, where to go and who to know in this year’s captivating, iconic Olympic host-city. (All images are by the author unless otherwise noted). With white beaches framed by majestic mountains, Christ the Redeemer’s open arms over Guanabara Bay, scenic Sugarloaf Mountain, and beautiful women in bikinis a la ‘Girl from Ipanema’ dancing the samba into the wee hours of the morning, the name “Rio de Janeiro” brings a wide variety of beautiful, romantic, tropical and almost surreal images to mind. Sure, the cidade maravilhosa (marvelous city), as locals refer to their home, has some problems: high crime rates, favelas (slums), drug wars and now, the dreaded Zika virus. But having lived there, I have to say that the press makes a much bigger to-do of all this than it actually warrants. As we kick off the 2016 Summer Games, I’ve decided to focus on Rio’s good side, and share with you some of my favorite places to go, eat, shop, stay and play in the hopes that you come to love Rio as much as I do. Traveling to Rio couldn’t be easier, especially now that Brazil has waived its visa requirements for American travelers through September 18. There are a number of non-stop flights from the US to Galeão International Airport (GIG) — all three major US airlines fly to Rio, and LATAM Airlines Brasil (formerly TAM) offers service from Miami and New York. Alternatively, you can fly to São Paulo (GRU) and then connect to a shuttle flight to Santos Dumont Airport (SDU), which has two advantages: SDU is located right downtown so you’ll be able to avoid the often horrendous traffic that snarls the route from GIG into the city. Not only that, flying from GRU to SDU is just a quick one-hour hop. 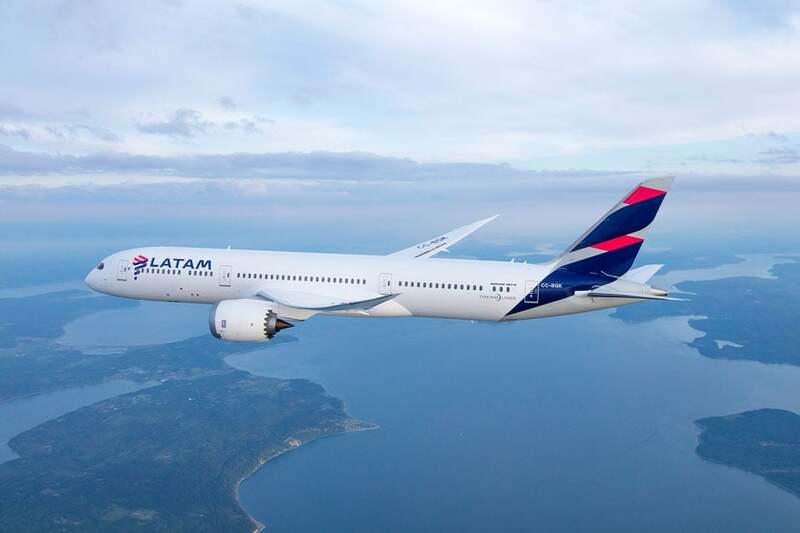 LATAM Brazil (formerly TAM) will fly you nonstop to Rio from New York and Miami. Image courtesy of LATAM Airlines. Taxis are easy to find and relatively cheap, especially given the great exchange rate with the Brazilian Real at the moment (at the time of this writing, $1 = 3.17 Real). The subway is also a safe, easy way to get around the city — during rush-hour, there are female-only cars and this is well enforced. If you really want to dive in and learn a little Portuguese before heading South, Moises Santos is one of the best language instructors around and he teaches via Skype, which makes learning before you go a reality. After three weeks of classes with him, I was completely conversational. He has an impressive resumé, having taught at two of Rio’s major language schools in addition to providing classes to diplomatic personnel in the city. For more information, shoot him an email at Moises.Santos85@gmail.com. Nothing is more carioca (the term used to refer to locals or anything Rio-esque) than a day on the beach. It can be a borderline religious experience, with sights, sounds and smells that you simply won’t come across on any other beach in the world. Rio’s main beaches are in the neighborhoods of Copacabana, Ipanema and Leblon (called the Zona Sul, or South Zone) and are marked by lifeguard posts — posts 1-6 are in Copacabana and posts 7-12 cover the stretch along Ipanema and Leblon. The Copacabana stretch is certainly iconic and features great views of the legendary Pão de Açucar, or Sugarloaf Mountain. It is, however, closer to the now notoriously dirty Guanabara Bay, and the water isn’t quite as nice as it used to be. The difference when you go around the bend to Ipanema is quite palpable — the waves are bigger, the water is a little clearer and the views of the mountains behind Leblon are every bit as stunning as the views you’ll get in Copa. You really don’t need to bring anything more than a towel, sunscreen and a little cash or your debit card, since they’re accepted almost everywhere in Brazil, even by beach vendors — although some will not accept cards that don’t have a chip. Umbrellas and chairs are available to rent all along the beaches for very reasonable prices (usually $5-7 for both, for the day) and the kiosque (stand/vendor) where you picked up your umbrella and chair will also bring you cocktails, beer, cold water and sometimes snacks if you order them — you’ll get a little piece of paper and pay your whole tab at the end of the day. Frankly, it’s a brilliant system. In particular, make sure you get your beer from your kiosque instead of from a beach vendor, as the kiosque will usually provide a coozie to help keep it nice and chilled. Ice cold Antartica beer and Globo biscuits on the beach. Doesn’t get any more carioca than that! And then there are the beach vendors, who can pretty much sell you anything — sandwiches, queijo coalho (cheese on a stick, grilled right in front of you with oregano) and drinks. 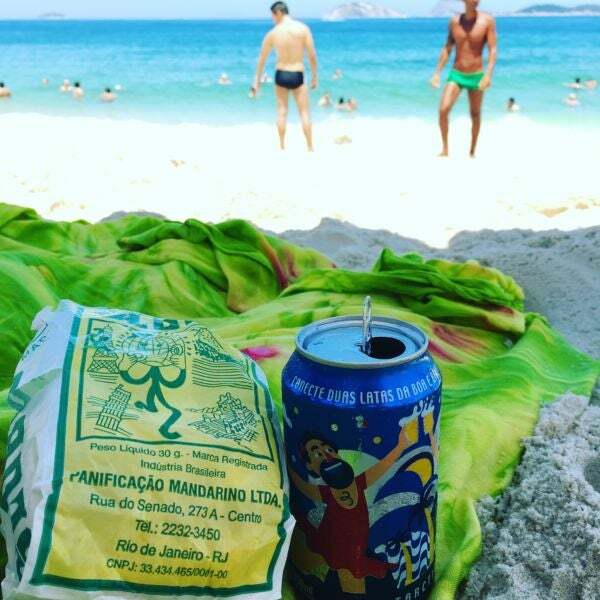 For a truly carioca experience, try the biscoito globo (Globo crakers), which cost about $0.50 a bag and go brilliantly with a cold beer. The mate leão (local iced tea) that you see going up and down the beach in large, metal drums is also delicious and very uniquely Rio. One thing though: I would suggest avoiding the camarão (shrimp) that you’ll see on massive plates since they go up and down the beach in the sun all day, and I just don’t see sun and shellfish as being a great combination. As far as safety goes, the same rules apply here that apply in every other major city. Don’t bring more than you need and keep it simple by just bringing your towel, a little money and sunscreen. If you want to pop into the water and you’re all by yourself, take note of who’s around you and ask if they can watch your things or if you can leave your bag with them for a little while. Although I’ve heard stories of people being robbed on the beach, I’ve never had a single problem in all my years of being on the beach in Rio. Just be aware of your surroundings — a little common sense goes a long way. 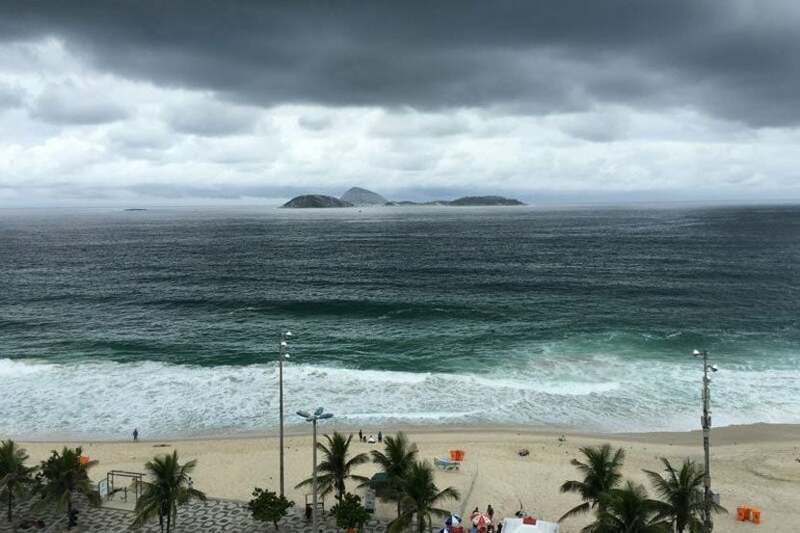 Even on a stormy day, Rio’s scenic views never fail to impress. After the beach, enjoying the city’s delicious culinary and cocktail offerings is another favorite past time. From the iconic botecos (neighborhood bars) to upscale restaurants, street-corner juice stands and ice cream parlors, Rio has something for every taste. First and foremost, every evening in Brazil should (and in my case, does) start with a caipirinha. These are the national cocktail, and are traditionally made with cachaça, lime and brown sugar muddled together and ice — it’s basically Brazil in a glass. The best part is that there are a million and one different variations on the tradicional so it can be made to suit almost any taste. I personally have always been partial to a good caipirinha de manga (mango) or maracuja (passion fruit). However, on my most recent trip to Rio, the bartender at the Fasano introduced me to something that changed my world — limão e caju (lime and cashew apple). If you’re not lucky enough to be staying at the Fasano and enjoying their stunning views of Ipanema from the rooftop deck — which is in theory only open to guests of the hotel — then I recommend heading over to Lagoa and grabbing a seat at Kiosque do Português. 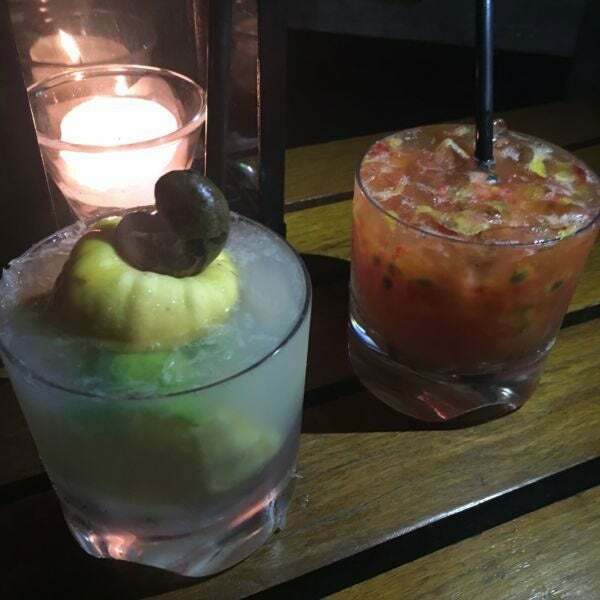 This place is known for their dizzying array of caipirinhas, featuring everything from the tradicional to ginger and tangerine to starfruit to strawberry and kiwi. Their location right on the lagoon also means that you’ll have a great view of rowing events that will take place there during the Olympics. Caipirinha creations from the bartender at Fasano — cashew apple and lime on the left, strawberry and passion fruit on the right. Rio is also known for its botecos, local bars serving cocktails, cold beer and petiscos, or little bar snacks that can be a great alternative to a full-on dinner in a sit-down restaurant. You sit outside, mingle with the locals and eat a lighter meal than you normally would, which given all the sun and humidity, is probably what you’re in the mood for anyway. One of my favorites is Pavão Azul in Copacabana. This little boteco became so popular for its cold beer and delicious patanisca (cod fritters) that it now exists on both sides of the street, having bought the space directly across from the original and expanded to it. This is as carioca as it gets — sitting outside, enjoying a drink and some snacks and soaking up a little local flavor as you wind down from the day and get ready to head back out at night. Whether at Pavão Azul or another boteco, some petisco staples you shouldn’t miss include frango passarinho (little pieces of chicken fried with garlic and parsley, served with lime), carne seca (dried beef), filete aperitivo (beef sautéed with onions), and bolinho de bacalhau (cod fritters) — although nowhere will you find one as delicious as the patanisca at Pavão. If it’s a sit-down dinner you’re after, Rio has you covered there, too. There’s no shortage of fantastic restaurants here. Zaza Bistrô Tropical in Ipanema is a personal favorite — it has a great terrace and their cocktail menu is nothing to be sneezed at! Original concoctions like the Zaza Fresco (fresh coconut water, Absolut vanilla and grated coconut) or the Shangri-La (Vodka, strawberries, cranberry juice, mint, lime juice and a chili-chocolate rim!) will have you feeling fabulous about the evening to come in no time flat. If you’re hungry for feijoada (a popular stew with beans, beef and pork), head to Casa do Feijoada. Just make sure you book a table at either spot, as they tend to fill up quickly. If you really want to splurge, the Fasano al Mare restaurant (in the Fasano hotel) does a tasting menu that beautifully combines the best of Italian cuisine with the freshest of seafood and locally-sourced produce. Note that their wine list borders on being extortionately expensive. The Leblon and Botafogo neighborhoods have plenty of great restaurants, too, if you feel like venturing out from the heart of the Zona Sul. Once you’ve had your fill of sun and food, it’s time to hit the stores. Brazil is a mecca for design and fashion, and the huge variety of local designers means you can find something with unique, carioca flavor that you won’t be able to buy anywhere else. One of my favorite spots is Hermes Inocencio in Ipanema. The store, named after it’s owner and chief designer, sells one of a kind t-shirts, bathing suits, tank tops and other beachwear designed by Hermes himself. His pieces are every bit as colorful and unique as the city, and you won’t find his wares anywhere else. Another great local designer is Isabela Capeto (Rua Alberto Ribeiro, 17), who designs women’s clothing with a wonderfully chic, carioca feel to them. Lenny Niemeyer is a homegrown brand of women’s beachwear that’s now available in the US as well, but the brand has a number of items that you can only find at its stores in Brazil — there are 11 outlets in Rio, so you should be able to find one nearby. 1923 Boutique, located in the Copacabana Palace Hotel, has some very unique (although pricey) jewelry on hand. For something uniquely carioca, try local jewelry designer Monica Pondé, who has stores in Leblon, Ipanema and Gavea. One of my favorites is Maria Oiticica, a brilliantly unique local jewelry designer, who incorporates local seeds, wood and other environmental elements into her “bio-jewelry.” The best part is that in addition to her stores in town, you can also find a shop in the international departures area of Terminal 2 at GIG, just in case you were too busy watching the Summer Games to go shopping. Given the undoubtedly grueling schedule of beaching, eating and shopping that you’ve now put together for yourself, you’ll be looking for somewhere to lay your head and get some well-deserved rest. And like any major city, Rio has a wide range of accommodation options available. SPG fans will be wowed with amazing views of Ipanema from the Sheraton Grand Rio Hotel & Resort in Leblon (rates from $225 or 12,000 Starpoints per night in late-August). If Marriott is more your style, try the JW Marriott Hotel Rio de Janeiro (rates from $248 or 35,000 Marriott Rewards points per night in late-August) if you want to stay in the Zona Sul, otherwise there’s also the AC Hotel Rio de Janeiro Porto Maravilha (rates from $90 or 25,000 Marriott Rewards points per night in late-August), which is closer to downtown. AccorHotels fans will be spoiled for choice, with 12 properties in the Zona Sul and eight more in the Downtown/Santa Teresa area. The highlight is definitely the Santa Teresa M Gallery Hotel by Sofitel (rates from $304 per night in late-August), which is also a Relais Chateaux property. 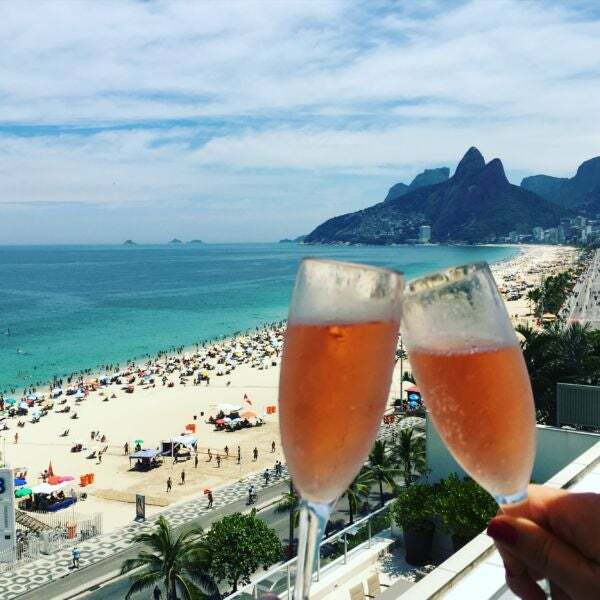 The rooftop deck of the Fasano is the perfect place to enjoy a glass of sparkling rosé while taking in Rio’s stunning scenery. If you’re not necessarily just in it for points, there are a number of other great options available as well. The Fasano (rates from $395 per night in late-August) is in a terrific location between Ipanema and Leblon and offers legendary beach views from its rooftop pool and bar. Note that the lower rooms have views of the dilapidated building behind the hotel and it’s worth splurging for an ocean view. The unfortunately named Casa Mosquito (rates from $220 per night in late-August) is a great option if boutique hotels are your thing. It’s located on a hill at the southern end of Copacabana and offers stunning views of Rio’s iconic landscape. Rio has something for everyone. The carioca joie de vivre is something you’ll feel as soon as you land, and before you know it even the most conservative, buttoned-up traveler will be dancing a little samba on the beach at midnight or swaying to the soft melody of some Bossa Nova while sipping a caipirinha. I sincerely hope that every one of you falls as hard and fast for Rio as I did. Boa viagem! Have you been to Rio? What are your favorite things to do there?